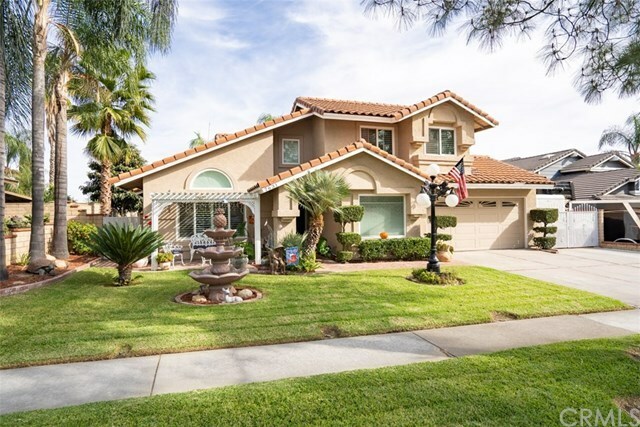 This 3 bedroom 2.5 bath plus a bonus room/office home is in a quiet neighborhood close to the 10 and 210 & 15 freeways and great shopping at nearby Victoria Gardens and Ontario Mills Mall. Store all your toys with ample, behind gate parking for your boat and RV and an attached two car garage. Inside you'll find an upgraded kitchen with granite counters, stainless appliances and recessed lighting. In the backyard you find a perfect spot to entertain your friends and family with large covered patio, TV hookup, lighting and fans, BBQ island and covered hot tub. Updates include dual pane windows throughout with plantation shutters or vertical blinds. Sliding back door has secure dog door. Local schools include Dona Merced Elementary, Cucamonga Middle and Rancho Cucamonga High School.